Image caption Thousands of Cubans are expected to travel from South and Central American countries to the Texas and California borders with Mexico this year. The first group from among 8,000 Cuban migrants recently stranded in Costa Rica have crossed the border from Mexico into the United States. Around 180 migrants flew from Costa Rica to El Salvador and from there made their way to the US Texan border. The migrants spent several months in Costa Rica after neighbouring Nicaragua denied them passage. But on 29 December Central American nations reached an agreement to allow the Cubans to continue their journey. 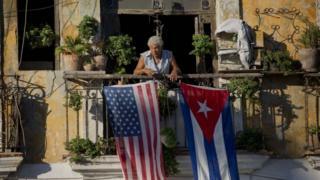 Thousands of Cubans have left the island in recent months, concerned that the re-establishment of relations with Cuba would prompt Washington to drop its policy of giving them automatic residence when they set foot in the US. A representative of a group which helps Cubans arriving in Texas, Cubanos en Libertad, said most of the migrants who had arrived came to join family members already living in the US, many of them in Florida. Many Cuban migrants first go to Ecuador, which until recently they could travel to without a visa. From there they travel to Colombia, into Panama and then Costa Rica, often travelling along people-smuggling routes. Many of them experience great danger. In Mexico, in particular, crime and drug gangs prey ruthlessly on migrants, often kidnapping and holding them for ransom and then killing them if no-one pays up. The current crisis began in November when Nicaragua, a close ally of Cuba, denied access to thousands of migrants arriving from Costa Rica.